We often hear reactions to creative work expressed with an air of excitement, “oh, that’s interesting” or “is that ever different”; quite simply, people just like experiences that go beyond the humdrum things seen every day. The same applies to direct mail and pieces that attract attention are far more likely to generate desired results for your small business when compared to familiar, “same old” pieces that normally land in our mailboxes. Example of a coffee cup die cut created for a Highland Marketing client. What kind of Die cut could your small business create? 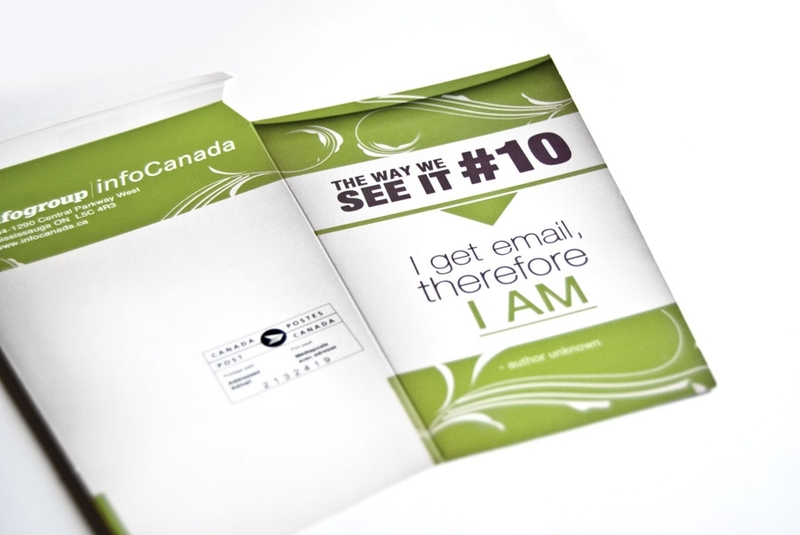 Die cuts are not only effective for getting your business noticed, they can also put a lot of fun into direct marketing. Sure, they need to be consistent with your brand and image, but it can be very rewarding to generate new and creative ideas. While we have designed numerous die cuts, we’ve also enjoyed watching clients come up with some outstanding ideas on their own after discussions with us. Obviously, businesses are curious about how well die cut mailers work. Although we are strong proponents of die cuts, and as much as we often ask our client to measure, we do not always have access to actual campaign results. I can say, however, that we use die cuts ourselves and have seen returns far in excess of the investments we have made. We also have one client who launched a pilot program earlier this year, in which they sent different Roundcards to different customers, based on specific information that they had collected. The program was such a success that they have continued to mail every two weeks. We also had a client for whom we’ve mailed over 400,000 house-shaped postcards, over the course of 20 different mailings. It’s probably a safe bet that this company has also seen positive results. Consider that their first drop was a mere 2,500 pieces. Since then, the quantities have grown to upwards of 30,000 pieces per drop. They would not be continuing to increase quantities in this manner if the program was not tremendously successful. Another question people often ask me is: how much do die cuts cost? Typically, we have found that they add about 25% to 50% to the cost of a standard print job, with the difference diminishing as volume increases. Of course, this does depend on both the size and complexity of the die. the incremental cost of well-designed die cuts, with good copy, certainly enhances the likelihood of their success. Although we are focusing on die cuts in this post, I will often stress these particular points by referring to a project where we mailed about 14,000 messages in wine bottles (over an 18 month period). Amazingly, this campaign actually returned every dollar budgeted to it long before it was even completed – and that was with an all-in cost of $16 per piece. It was a great project, but certainly not for the faint of heart. We must never underestimate the value of repetition. Yes, it’s possible that you may come up with an awesome design, great copy, and a superb offer that gets your phones ringing off the hook with just one mailing, but more often it can take two or three mailings (or sometimes more) to the same audience to really see significant results. I often tell new clients that if they want to be successful, rather than mailing to 9,000 new prospects once, they might consider mailing to the best 3,000 prospects three times. If the product is good, the copy is good, and there is a solid offer – it does work. It really does pay to be tastefully different and die cuts can help you stand out. Many of our clients have already put their “marketing in shape” and as we mentioned, it not only adds value, it also adds a lot of fun. Dave Ward is the president of Highland Marketing, which he founded in 1993 and built on the foundation of strong technical skills and a commitment to always trying to help clients achieve that most effective balance between cost and creativity. Dave is also the founder of the DM-Toolkit, a one-stop resource for integrated direct marketing, as well as a published author, with several of his articles appearing in Direct Marketing News. You can follow him on Twitter.